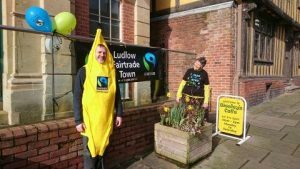 Ludlow was awarded Fairtrade Town status in November 2003. 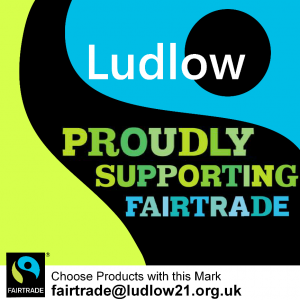 The Fair Trade Town Group is an integral part of Ludlow 21, supporting global sustainability through Fair Trade and Trade Justice and making links with the local sustainable vision of Ludlow 21. 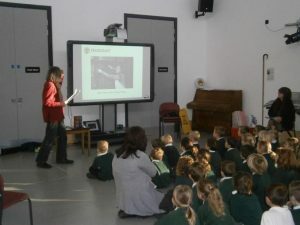 NEWSLETTER: Our January 2019 newsletter, with lots of news of events and Fairtrade, can be found here. Our Aims – To support and promote the sale of fairly traded goods and increase consumer demand in and around Ludlow. We are supported by businesses, churches, schools (as sub-groups), the town council and Traidcraft, each represented on our steering group. 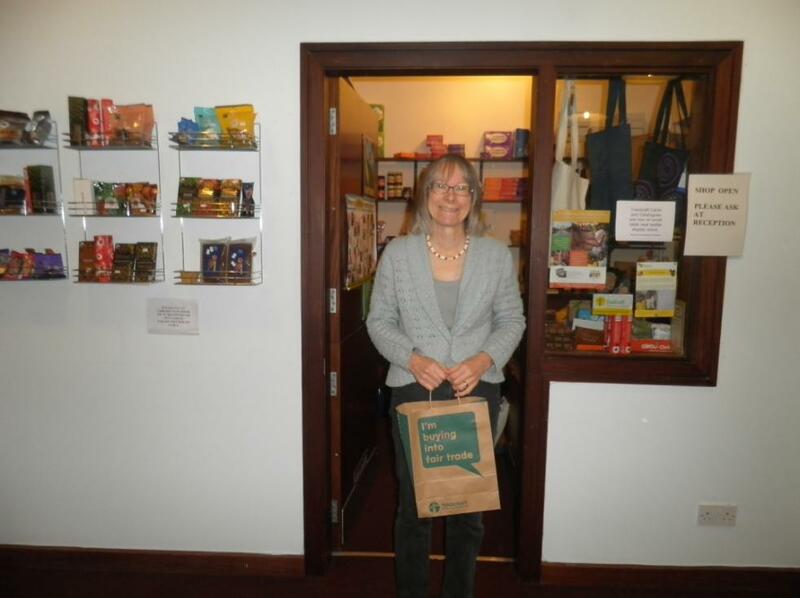 There are over twenty businesses in Ludlow which sell or use fair trade products. These range from gold and silver jewellery, clothing and crafts to a wide range of food items. There are also a number of cafes serving fair trade teas, coffee, hot chocolate and sugar. Ask for Fair Trade on the menu. A recent new initiative that has come from the Fairtrade Business Group has been the production of our own chocolate products which are fairly traded and also produced locally. It has been part of the formative work behind the creation of ‘Just Good Locally Ltd’ which is a small company whose aims are to promote local and fairly traded products and support local charities. The chocolate that we produce has come about through a collaboration between the Ludlow Fairtrade Business Group, local chocolatier Bonbonniere, the design team at La jewellery, the Ludlow Art Society and local volunteers. Currently we have chocolate bars in plain and milk chocolate and bags of chocolate buttons, again in plain and milk. The artwork is by members of the Art Society and a feature of our products is that the art work changes from one edition to the next in order to promote the work of a range of local artists. 20p from the sale of every bar or bag is donated to a local charity. At the Ludlow Food Festival in September we hope to launch a new product – natural/’healthy’ chocolate. Our chocolate is available through the following outlets: The Broad Bean, the Ludlow Food Centre, La jewellery, the Local to Ludlow café, Myriad Organics, the Parkway restaurant and Wesley’s café. Churches in Ludlow are committed to supporting fair trade. Wesley’s café and the Traidcraft outlet in Ludlow Mascall Centre have a Christian base but both have always reached out to people of any faith or none and have supporters and customers who may or may not be from a church background. 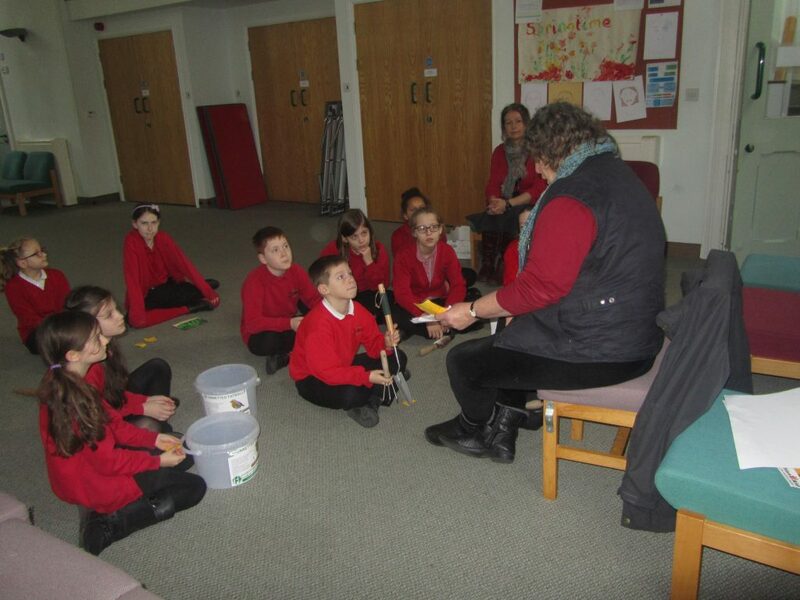 The Town Council supports fair trade and works closely with the Fair Trade Town Group. 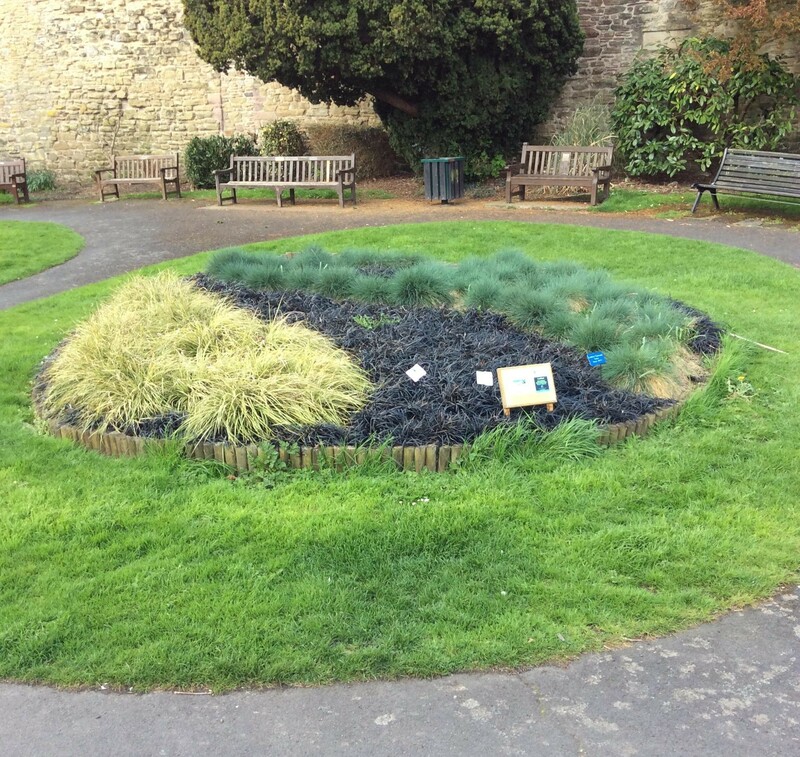 We worked jointly during 2016 on depicting the Fairtrade Mark through the redesign and re-planting of the circular flower bed (next to the cannon near the castle) The bed uses perennial planting and is easy and cheap to maintain. Traidcraft operates separately and is run as a Fair Trader enterprise with Traidcraft in Gateshead. There is a small but well stocked Traidcraft outlet in Ludlow Mascall Centre which supplies goods to other stalls in town and elsewhere. 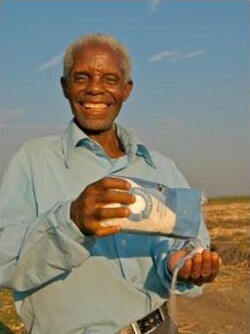 The Fair Trade Group and Traidcraft work closely together. Permanent Traidcraft stall, Wesleys Café, Ludlow Methodist Church (a Churches Together Around Ludlow venture) and during Fairtrade Fortnight. St Laurence’s Church – Sunday mini Traidcraft stall and special stalls during Fairtrade Fortnight, Harvest and during the Christmas period. The Group also focuses attention on wider issues of unfair international trade, joining with national campaigns working to change the rules that govern world trade in favour of and not against poor people in the developing world. 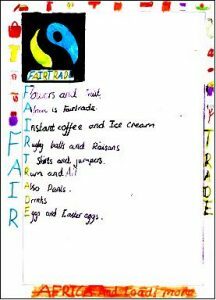 Fairtrade Fortnight takes place annually in February/March, across the UK. Local activities and displays are organised to draw attention to the issues around fair trade and promote the sales of fair trade products in order to further encourage the purchase of Fairtrade products. 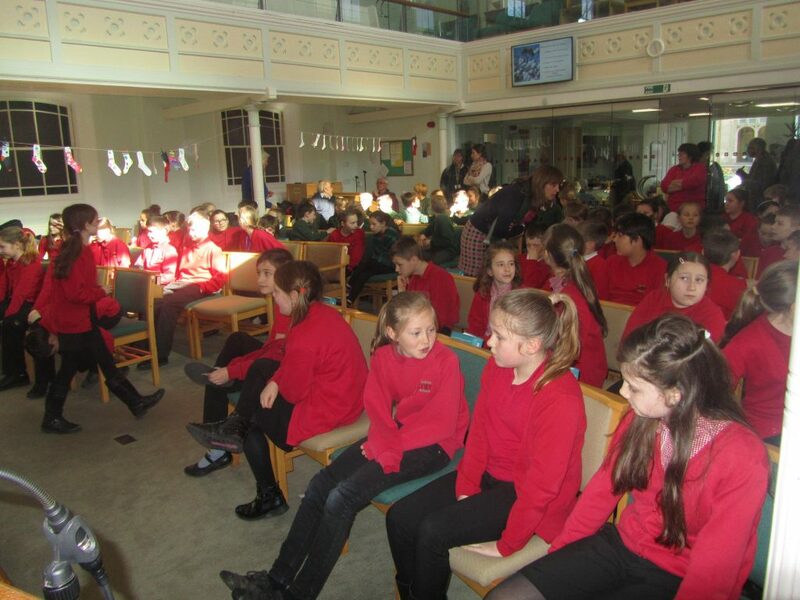 Schools’ Day during Fairtrade Fortnight 2018. See the fair trade socks! Volunteer to help man stalls and encourage the expansion of Fair Trade in existing and new locations in and around Ludlow. Our steering group would also welcome new members and new ideas. Would you like to promote Fair Trade through the use of Social media?